The best of both worlds... pizza + caprese salad, in one quick and easy meal. Pizza night is an easy family favorite. 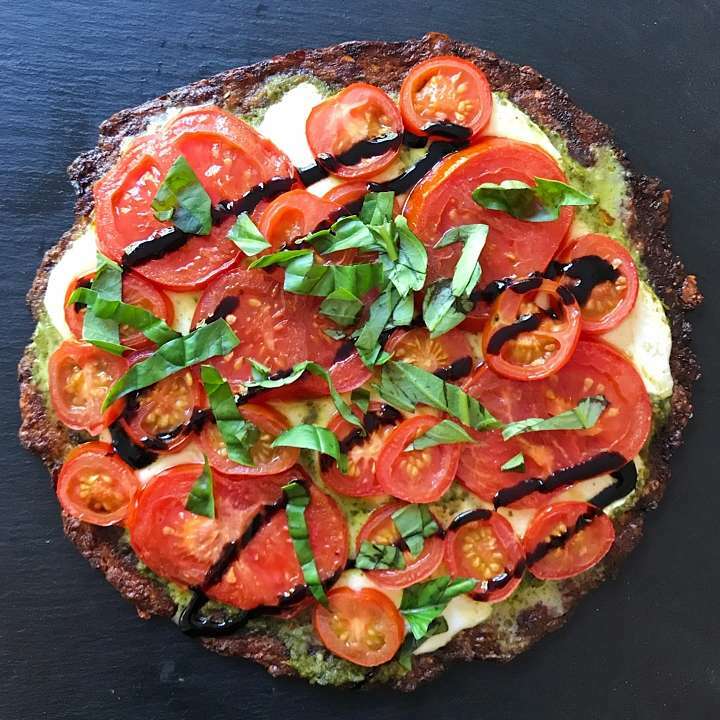 The boys usually opt for a classic cheese pizza but my husband and I love this fresher take: Grilled Cali’Flour Foods Cauliflower Pizza Crust, topped with store bought pesto, fresh mozzarella, roast tomatoes, fresh basil and balsamic glaze (we used Monaro Federzoni). It’s beyond yummy… and it’s super quick and easy because we’re using so many already prepared, high quality ingredients. I grilled the Cali’flour Foods pizza crust for 5 minutes on an indoor grill pan, then added basil pesto and melted fresh mozzarella all while roasting the tomatoes quickly for 10 minutes. Top the pizza with the roast tomatoes, fresh basil and balsamic glaze and that’s it! A melt in your mouth delicious dinner in 20 minutes. Cali’Flour Foods cauliflower pizza crust has been a real game changer for us. Made with only a few ingredients, it tastes homemade, has a great texture and such a time saver. They have 3 varieties — an Original Italian Cauliflower Crust, Sweet Red Pepper Cauliflower Crust and a Plant-Based Italian Cauliflower Crust. We love that it’s naturally gluten-free and is also a great way to get in some extra veggies. Given our busy days, these pizza crusts make regular appearances in our kitchen. The best of both worlds-- pizza + caprese salad in one quick and easy dinner! 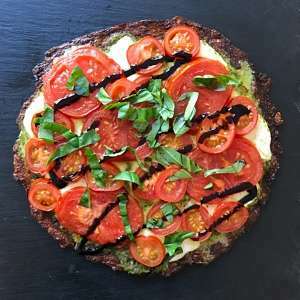 Grilled Cali'flour Foods cauliflower pizza crust, topped with basil pesto, fresh mozzarella, roast tomatoes, balsamic glaze, and fresh basil. It took no more than 20 minutes to make, start to finish and is melt in your mouth delicious! Preheat oven to 400 degrees. Gently toss tomatoes in olive oil and a dash of salt. Place in a single layer on a baking sheet and roast for 10 minutes. Add the pesto to pizza crust, then fresh mozzarella and melt the fresh mozzarella, approximately 5 minutes. Remove from grill. Top the melted cheese with the roasted tomatoes, balsamic glaze and fresh basil.